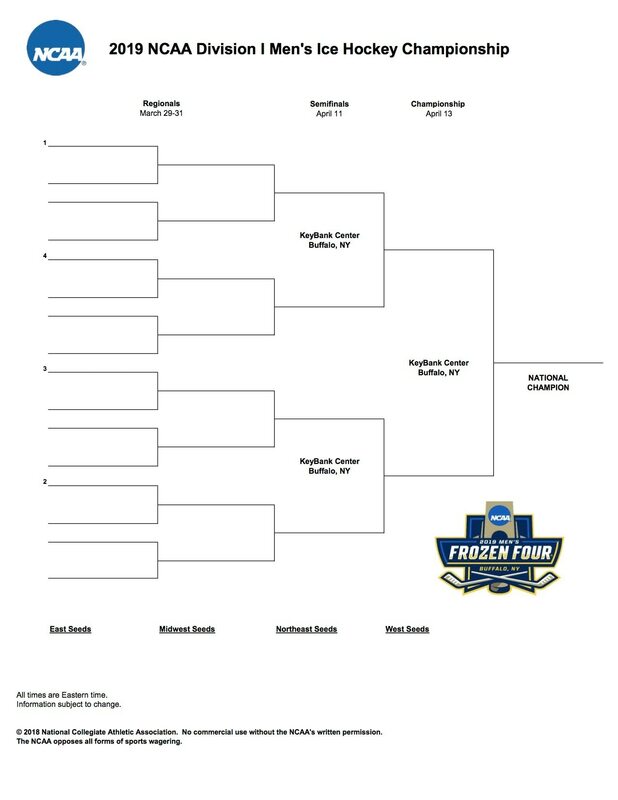 The 2019 NCAA DI men's ice hockey tournament bracket is updated for the 2019 Frozen Four. Find a printable bracket below. Denver, UMass, Providence and Minnesota Duluth advanced to the Frozen Four in Buffalo. UMass and defending champions Minnesota Duluth will meet in the finals. 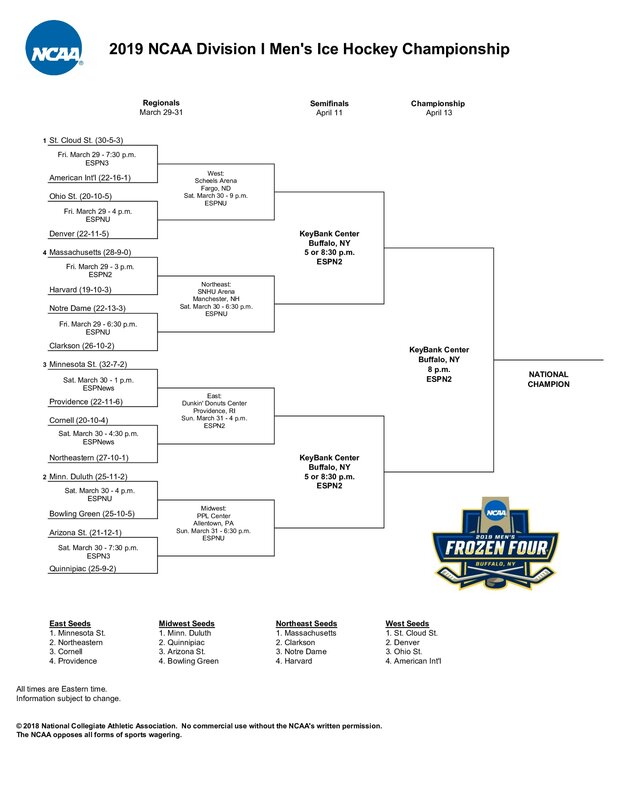 Here is the official printable NCAA DI men's ice hockey tournament bracket for the 2019 Frozen Four. You can click or tap right here to open up a printable version of the bracket pictured below in a new tab or window. Here is a .JPG of the 2019 bracket if you'd like a copy in that format. Click or tap here for a printable PDF. You can click here for a complete breakdown of the championship selection process. Here is the complete schedule for the 2019 Frozen Four, which will take place at the KeyBank Center in Buffalo, New York. The official championship bracket was announced during the selection show on Sunday, March 24, on ESPNU. Before the final four teams head to Buffalo, they must get through regional action. Regionals for the NCAA Division I Men’s Ice Hockey Championship will be held March 29 - 31 at 4 locations. At each site, four teams will compete in single-elimination Regional Semifinal competition. The two winning teams will then compete against each other in single-elimination Regional Final competition at the same site. The winning team from each of the 4 Regionals will advance to the Frozen Four in Saint Paul.